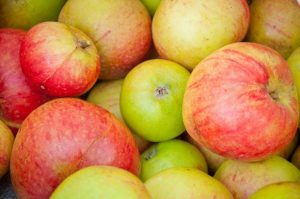 Different varieties are ready at different times – there are local varieties that reach perfection on the tree or in storage from August right through to May, ensuring local apples were once available nearly all year. You can grow these old varieties yourself, with trees available from GOT or from other local suppliers (see our Nursery page) They be grown on different rootstocks to ensure the tree grows to the right size for your garden or orchard. Longney Russet, Elmore Pippin, Arlingham Schoolboys, Kill Boys, Severn Bank, Hagloe Crab, Ashmeads Kernel, Leathercoat, Hens Turds, Tewkesbury Baron, Siddington Russet, Taynton Codlin, Quoining, Costard, Nonpariel, Flower of the West, Rose of Cirencester, Royal Turk, Over Apple. For a full list of names visit our Gloucestershire Apples Listing page. 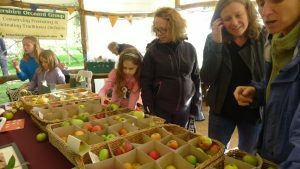 A heritage collection of Gloucestershire apple varieties has been planted in GOT’s Longney orchards to ensure these old varieties saved for future. The planting for the Collection has now been completed (during winter 2017/18) and we will be posting more information about this soon. 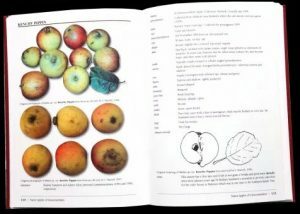 Charles Martell’s book Native Apples of Gloucestershire has been published by GOT as part of the Gloucestershire Pomona series. It describes all the apple varieties of the area. It complement our other books (also by Charles) on Gloucestershire’s Pears and Plums. Details of all these are available on the bookshop page of our main website. We have a full list of Gloucestershire Apple Varieties on this page https://glosorchards.org/home/fruitvarieties/gloucestershire-apples-listing/ and we will be adding pictures, where we have them, to the list soon. 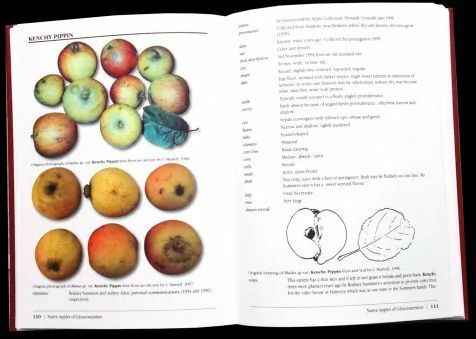 We are setting up a Members’ Page soon with additional information on varieties including, for apples, notes on the Origins of Ashmead’s Kernal. the Origins of domestic apples in general and Apple tasting notes.